There are a few ways of making fennel tea, you can use the feathery leaves, chopped fresh root or the potent ground powder. I tend to use the whole seeds more than the fresh leaves or root, as I always have them available. I do recommend using whole seeds and coarsely grinding them yourself using a coffee grinder rather than buying pre-ground powder. *I don't boil the ground seeds for long as this can destroy their essential oils and therefore some of the fennel health benefits. Click here to go to the main herb and spice tea page. Like other herbs and spices, there are a whole host of fennel benefits essential to your well-being, and even if you're not ill a daily dose of spice tea is a good way of getting extra vitamins and minerals. 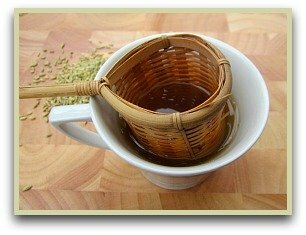 Drinking this fennel seed tea can also give relief from stomach issues like constipation, indigestion and gas. Plus the strong aniseed flavour is excellent for freshening the mouth and combating bad breath. I make another version of this drink, one that also uses caraway, orange rind and the feathery leaves, click here for my recipe. More Homemade Drinks You May Enjoy!